I served cut up pineapple as a little snack at a get-together recently, and a friend remarked that she never serves pineapple to her kids because she doesn't know how to cut one. I wondered if there might be other readers out there who are unsure of cutting and serving pineapples...they are a bit scary looking with their spikey sides. Pineapple is such a yummy summertime treat, so today I'll show you a quick tutorial on How to Cut and Slice a Pineapple. I think its important for bloggers (and readers) to remember that there are plenty of people with zero kitchen experience. We all have to start with the basics at some point, and learning to slice a pineapple is one of those basic kitchen skills. You really only need a couple of things to make this work: a pineapple (duh), a cutting board, and a good knife. 1. 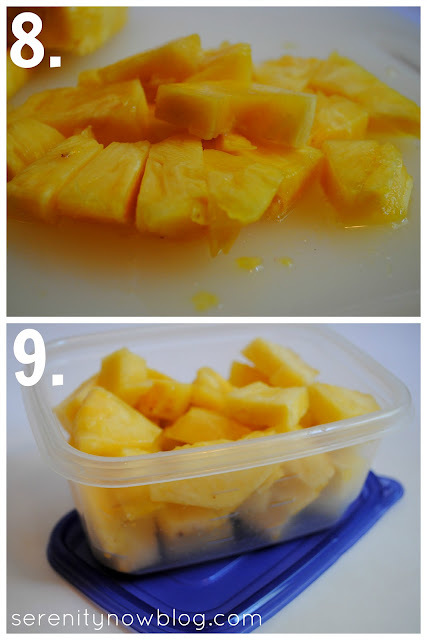 Lay your pineapple on its side and slice the lovely green top off. 2. Turn it around and hack the bottom right off. 3. Set your pineapple right side up and slice off all four sides, being careful not to cut too deep and waste tasty pineapple. 4. 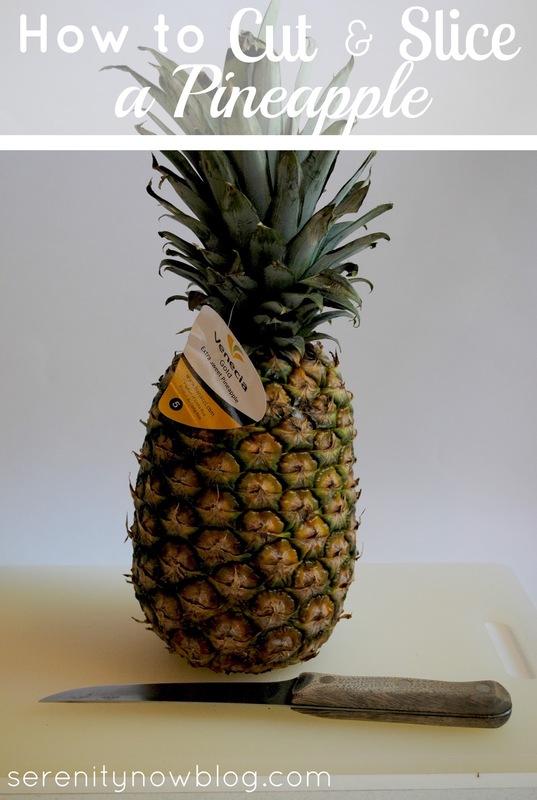 You'll be left with a nekkid pineapple with little spikey bits left on it. Don't panic! 5. Use your knife to slice away those little spikey bits that were left behind and discard them. 6. 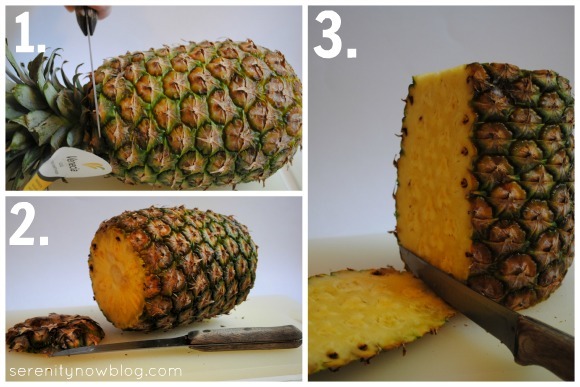 Turn your pineapple log on its side and slice some lovely squares. 7. Use a smaller knife (if you have one) to cut the circle core out of each slice. 8. 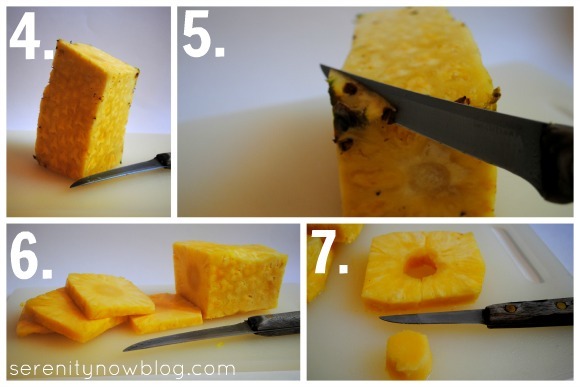 Cut small slices or cubes from your cored pineapple squares. 9. 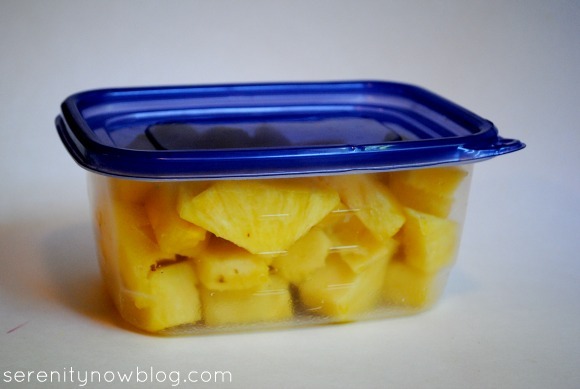 Store in a tupperware container in your fridge for a tasty snack. What's your favorite simple kitchen tip? have you ever used a pineapple corer? that thing you twist? it's easy to use, but since you're twisting, and squeeeezing, the juice gets everywhere. what a mess the one time i tried it! You're right, Amanda! There are so many things that we know, and it's easy for us to assume that everyone else knows them as well. And yet there are always people who are just starting out, just learning--we could bless them with our knowledge! Thank you for being a good example here. I'm not sure that I've ever bought a fresh pineapple. Thanks for explaining how easy it is to cut it up yourself. We love fresh pineapple too! I like to use a serrated bread knife to cut it. I also once heard Rachael Ray say that you know a pineapple is fresh when all its little spikes are pointing up. You are so right about going back to basics. I think since they took home ec out of schools, there is a knowledge gap for some of us in the more basic skills. When I got married I had to Google how to roast a chicken, which is also a super easy basic kitchen skill, but most of my friends don't know how to do it. I use Pampered Chef's Pineapple Wedger. LOVE it! I do Bountiful Baskets and we often receive fresh pineapples in our baskets. The wedger makes it so I can have the pineapple peeled and cored in just a minute. So awesome! "You really only need a couple of things to make this work: a pineapple (duh), a cutting board, and a good knife." Perhaps the best lines in this post! Nice job. you know, this something i have never done! AND i LOVE pineapple! thanks for all the pointers. I cut pineapple all the time. I recently got that pineapple corer thing which is cool because you get a pineapple slinky and it produces like a full cup of fresh pineapple juice. You gotta try it. It's a great and fast way to cut the perfectly round slices with the core already out. The other way I cut it is the same way you do, by cutting off all the scales. But then I cut straight down the log on the right of the core, then the left, then the remaining two sides. Then I can just cut those pieces up and there's no need to cut out each individual squares. Did you know that after you cut the top off, it can be planted...just like it is...and it will grow into a BIG plant and after awhile a little pineapple will appear! Also, my husband and I twist the leaves off; they come right off. Then we slice it in half, then each half in thirds. Next slice off the core and using a grapefruit knife, which is curved and serrated, slice between the fruit and the edges. Really easy and no wasted fruit.